Six-time Malta Marathon winner Mohamed Hajjy had to settle for second place. El-Baazouzi crossed the finish line with a time of 2:18:31, with Hajjy making it in 2:18:58. Kenyan runner Henry Kipsang, came in third place with a time of 2:25:06. Andrew Grech was the first Maltese runner to cross the finish line, coming in seventh with his time of 2:30:15. Polish runner Anna Wasik's time of 2:53:47 placed her first among all female marathon runners competing, with the Czech Republic's Nikolina Sustic in second (2:56:38) and local athlete and last year's winner Josann Attard Pulis in third (3:00:48). The top runners led a pack of 900 runners taking part in the full marathon this year. A further 3,500 took part in the half-marathon, with the combined total representing a record high for the yearly event. While the number of Maltese participants remained the same as last year, there was a substantial increase in the number of foreign participants. A total of over 2,900 foreigners applied to participate in the 33rd edition of the Malta Marathon. Fabian Downs from Switzerland (1:08:52) and local runner Charlton Debono (1:09:35) placed first and second respectively among the men in the half-marathon. Maltese athlete Luke Micallef placed third (1:11:49). Local athlete Lisa Marie-Bezzina was the first woman to cross the finish line, clocking in with a time of 1:19:27, with Roberta Schembri also from Malta in second place in a time of 1:20:58 and Mandy Dohren of Great Britain in third in 1:21:10. 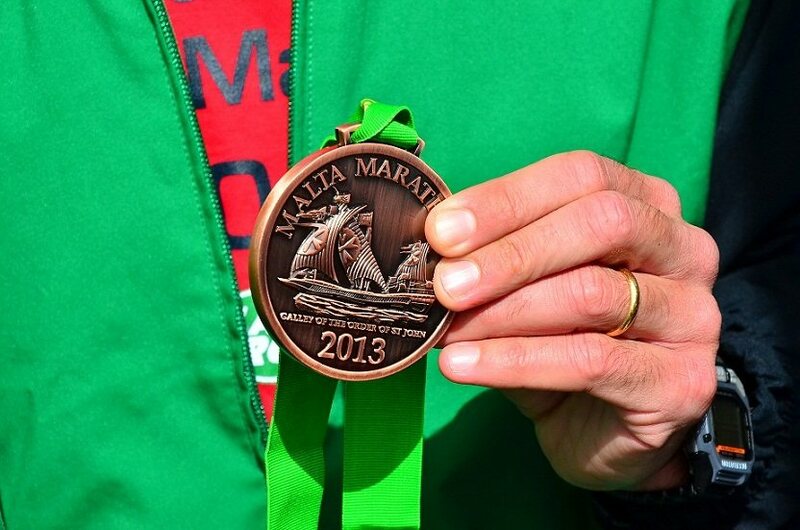 This is the 9th consecutive year that there has been an increase in the number of applicants for the Malta Marathon. In 2009 there were 490 Maltese and 547 foreign applicants, this year there were 2,000 Maltese and 2,900 foreigners. The foreign countries with the major number of applicants were the United Kingdom (808), Italy (529), Germany (250), Poland (155), France (153), Sweden (82), Japan (78), Greece (78), Ireland (64), Slovenia (54), Belgium (46) Hungary (45), Russia (38), Austria (37), Belarus (37), Spain (37), America (34) with the rest coming from a verity of other countries around the globe. The 2019 Malta Marathon and Half Marathon that will be held on the 24th February will certainly see another record number of participants. The Inspire Foundation is the Official Charity of The Vodafone Malta Marathon 2018 - Inspire works with children and adults with various disabilities such as Down Syndrome, Cerebral Palsy and Autism, to help them achieve the highest levels of independence. Noel Cacciatolo is one of Inspire's clients. Despite having lost his leg he will be participating in the Malta Half Marathon in aid of Inspire. Join Noel's team by choosing Team Noel when applying for The Vodafone Malta Marathon 2018. Team Noel participants can choose to run or walk as a team, or individually. This is a short and sweet 1st Malta Marathon Organising Committiee race of the season that paves the way through other MMOC races till the 2019 Malta Marathon & Half Marathon. Applications open on 1st July 2018. To apply go to the Applications page. The 2017 Mdina Glass LRC 10K saw a record number of participants. We aim to have another record in 2018. Once again the 2017 Express Trailers Zurrieq Half Marathon and 10K saw a record number of participants. It just keeps on getting better and bigger. Applications open on 1st August 2018. To apply go to the Applications page. Malta’s second most popular athletic event after the Malta Marathon. It's the oldest race in Malta retaining the same route for 39 years. Applications open on 1st October 2018. To apply go to the Applications page. Applications open on 13th November 2018. To apply go to the Applications page.